Treat yourself to a spa experience with exceptionally soft Spa Plush bath mats woven of lush, long-staple cotton for extra absorbency. This mat features a sophisticated design loomed by hand in combinations of high and low loops for subtle tone-on-tone patterns. This Spa Plush bath mat contains a generous 2400 grams of cotton per square meter for luxurious softness underfoot, and is backed with latex to prevent slipping. 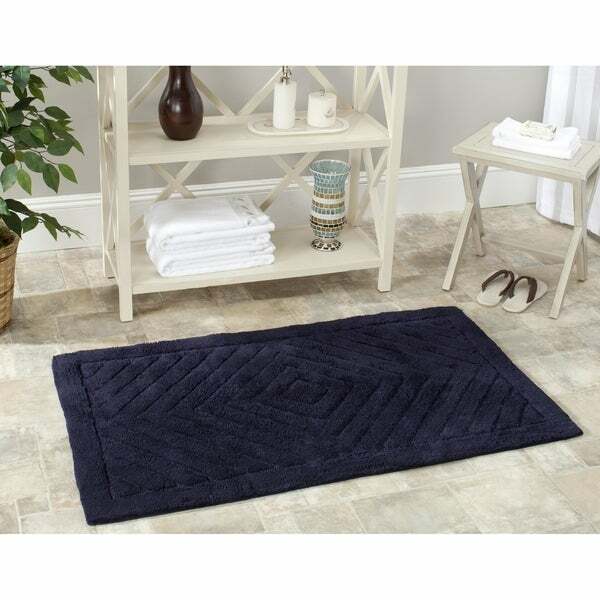 Bath rug measures 21 inches x 34 inches and this item comes in a set of two. Care instructions: Machine wash separately in cold water, mild detergent. No bleach. Tumble dry on low heat. This was a good buy and the color is rich...I love this purchase. Nice bath mats, comfy to walk on, and the pattern has the right amount of pop.. so they don't look like just flat slabs of blue, they have some interest in their presentation. Working great so far! Very happy with these. They are a TRUE NAVY (which seemed hard to find). Nice quality, subtle pattern, non slip back that's not "rubbery." Great color and style to these. The are exactly what I was looking for and seem like they will last a long time as well. Perfect match to my bathroom! Quality, washed great. I dry on a line, not dryer. Just what I wanted.. Made the bathroom look more elegant.